I've been a fan of model Porches ever since if I first saw Wilco Machiels' Porsche Dioarmas. After writing my original post on Wilco I was fortunate enough to reach an agreement with him that allowed me to purchase one of his masterpieces for my burgeoning collection. That's a picture of it below. Yesterday, I stumbled across something that I think would give even Wilco pause. 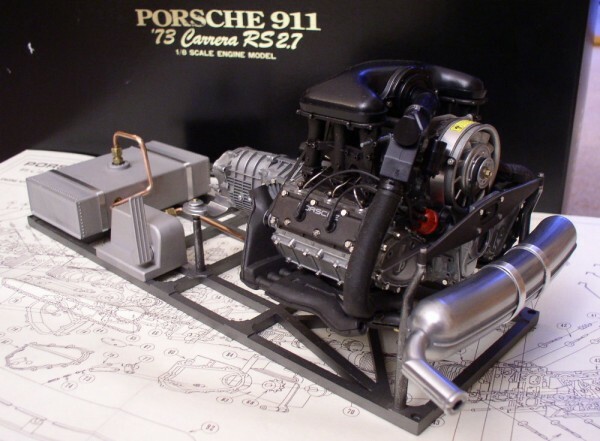 The 1/8 911 Carrera RS 2.7 engine by Marushin. What's so special about a scale model engine? Nothing really, unless of course you take into account that this one actually works and does so all the way up to 5500 RPMs! This miniature masterpiece was created under license agreement from Porsche by the Marushin company in Japan. Inclusive of a functioning crankshaft, pistons, camshafts, timing chain with tensioners, rocker arms and valves, the model kit consists of over 500 component parts (not including hundreds of screws) in cast zinc, aluminum, copper, steel, brass and rubber. The exhaust box is also in metal and the air intake cowling is plastic, as per the original engine. Unfortunately, based on what I've been able to find online, this model is a one-off. It seems that either Marushin couldn't figure out how to properly market the model or just decided to go in a different direction. Either way, they are no longer available for sale. Do you know the difference between a Croc and a Cayman? I’d LOVE to put that together! Then again, 5,000 piece lego creations still amuse me, too. The headache and frustration are part of the ENTERTAINMENT value, that’s why these things are so expensive! You can’t find those feelings just anywhere, John! I would be so all over purchasing one of those… maybe two.. one to keep in that beautiful case, and one to put together. Talk about learning how an engine works without the need of a full blown shop! I have two of these Marushin Engines. 2.7 Porsche RS. Both in the boxes. Never been assembled or opened. Let me know if you would still be interested. I have been offered $3000 for the one in the Wooden case. I still have one in the black box. Hey Don, my Name is John from Germany. Do you still have the engine? I am interested in buying one. Discovered this post while searching for a model engine. Do you still have one available ?